Brave cat or cowardly dog? I think the doggies is looking shocked because that tabby is so tubby! Exactly why I keep my nails long - ya just never know! Is that baby lion, cub eh? :) Great pic you've got here. Cool! A superb catch of the lens. 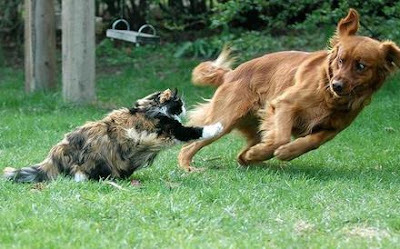 lol, the dog is finding out that the cat doesn't play games. Mad cats are funny as hell, but stay away from them.